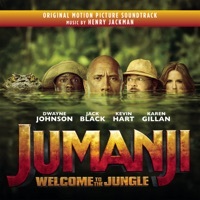 Jumanji: Welcome to the Jungle consists of 5 credited songs, from artists including Big Mountain, Bleachers and Guns N Roses. The official soundtrack consists of 29 tracks, and consists of tracks by Henry Jackman. Find the complete playlist, official soundtrack and trailer songs below. Make an account to add scene descriptions and contribute to our community.